4. april – 18. april 2018. 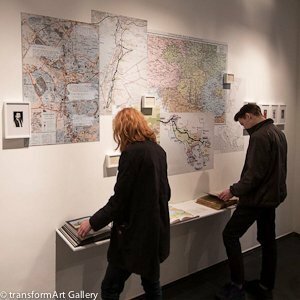 In TRAVELOGUE SAMMLUNG 1973-2017, artist, storyteller, collector and conservator Lukas Birk draws photographic material out of his family albums and the extensive personal archive of the regions he investigates to repurpose and reversion old books of his collection. On the pages of these out-dated/vintage publications, Birk inserts images of his family history and trajectory as an artist. 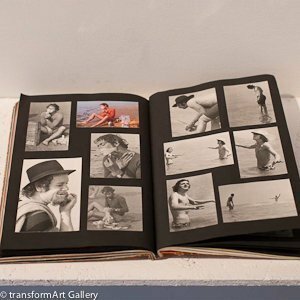 The displaced photographs generate displaced contents and readings within and out of the book pages. They confer the old family publications with new significations and contexts, while reinventing and enriching their content and the nature of pre-existent photographic collections. Based on visual recollections of journeys that took place from Austria to the Middle East via the Balkans and back to Europe, Birk’s storyline examines and revisits notions and clichés such as the trappings of exoticism, the “Other” as a Western construct, folklore and the status of the artist. 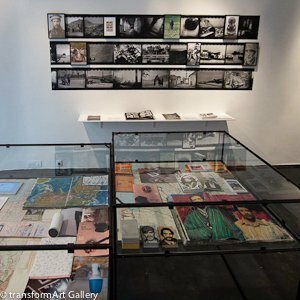 By throwing pictures back to the arena of history and by mixing heterogeneous materials –personal work, appropriated images, and archival resources of all kinds- it reinforces novel associations in the personal and collective memory. Stepping back and forth in time, it challenges the visitors to engage with content according to their own personal visual and emotional connections. From the archive and the family album to vernacular and fine art photography, from the intimacy of the family realm to ruthless public exposure, from the personal to the universal, the product of this operation is a novel archival assemblage and palimpsest of prints, books and objects, both real and imaginary in private and historical terms. This remix is displayed on the wall as a fascinating hybrid narrative of all sorts that unwraps: the lifetime of three generations of men; the birth of an artist; the trappings of global masculine identity, and last but least, the ultimate destiny of a collection.